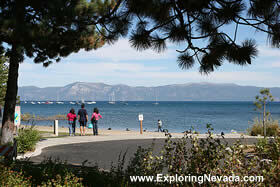 The northern end of Lake Tahoe is just as popular among tourists as is the southern end of the lake. Numerous towns along the northern shore of Lake Tahoe provide lodging and vacation spots. The northern end of Lake Tahoe is also where some of the finest skiing in the Tahoe area is located. Squaw Valley, North Star at Tahoe and several other major resorts are all located near the northern end of the lake. On this page, lodging options in Tahoe City, Tahoe Vista, Incline Village, Crystal Bay and Squaw Valley are shown. For lodging options on the southern end of Lake Tahoe, visit the South Lake Tahoe Hotels page.